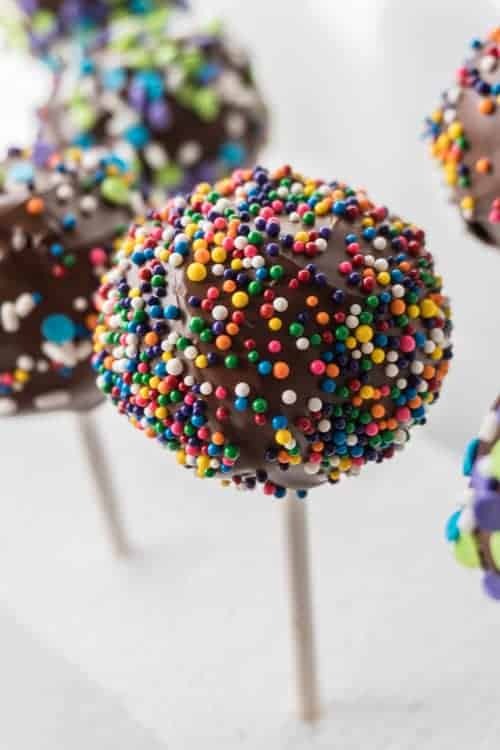 These chocolate cake pops are easy to make and are so fun to eat! They can be decorated with any type of sprinkles for a fun and festive dessert! 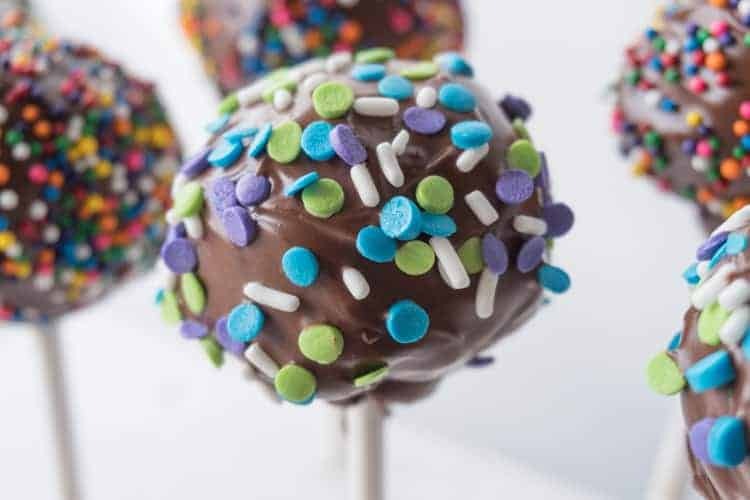 This easy cake pop recipe actually came from a happy accident. You see I was try to make a chocolate log to celebrate the new Hearthstone expansion, because the log swirl looks just like the Hearthstone symbol. I thought I’d make my marshmallow frosting, add blue dye and have a fun and festive cake ready to celebrate playing the game. Well, cake logs are much more tricky than I anticipated. The first cake cracked completely (even though I rolled it while it was warm). The second cake was much more promising. However, after adding the frosting and re-rolling it, it soon became an ugly caved in mess. So instead of throwing out all the yummy cake I decided to make cake pops! 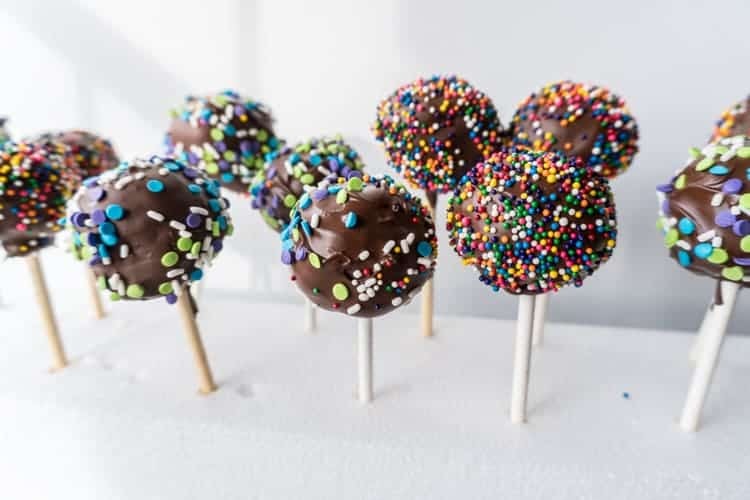 Cake pops are actually really easy to make and perfect for when you have a cake fail like me! Just take the cake, crumble it up, add frosting and form into balls! 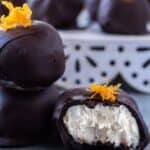 Freeze the balls with the sticks in them, and then dip in your favorite chocolate! Easy! The ones pictured here actually have my marshmallow frosting and the dark chocolate frosting in them. It’s a double batch (since both cakes failed), so I had the two types of frosting. Plus there was no way to get rid of the marshmallow frosting since it was rolled up into the failed log cakes. 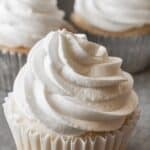 You are more than welcome to add the marshmallow frosting, but it isn’t needed! You can just make one cake and one batch of chocolate frosting. It will make about 14 cake pops and they will taste amazing! Oh and a quick note about the frosting. 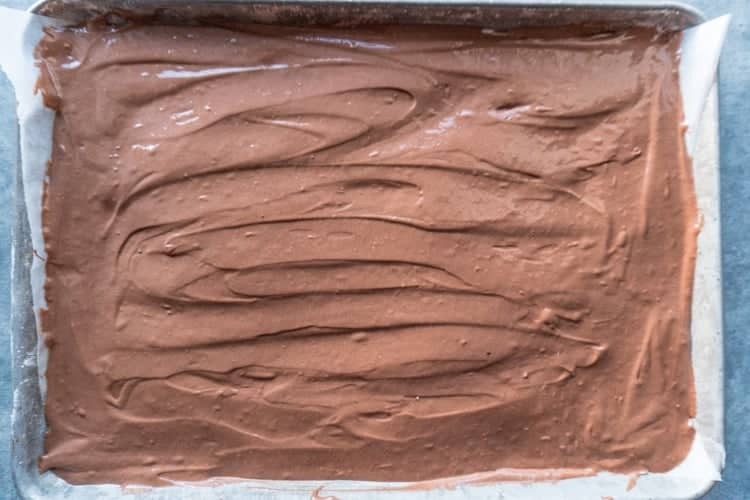 This Special Dark Chocolate Frosting is directly from the back of a Hershey’s Special Dark Cocoa Powder container. 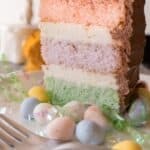 It is simple, delicious, and one of my favorite frostings ever. There’s no use in trying to reinvent the wheel when you have frosting as good and as simple as this! 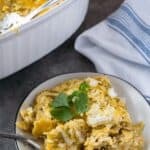 Do you have a favorite recipe that’s from the back of a box or container of food? I’d love to hear about! 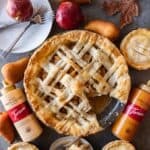 If you like this recipe check out my Hi-Hat Chocolate Cupcakes, Mini Apple Pies and my Disney inspired Sugar Cookies! 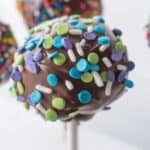 This easy cake pop recipe comes together in no time and tastes amazing! 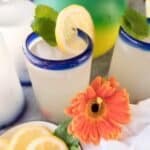 Fun for birthdays or any celebration! 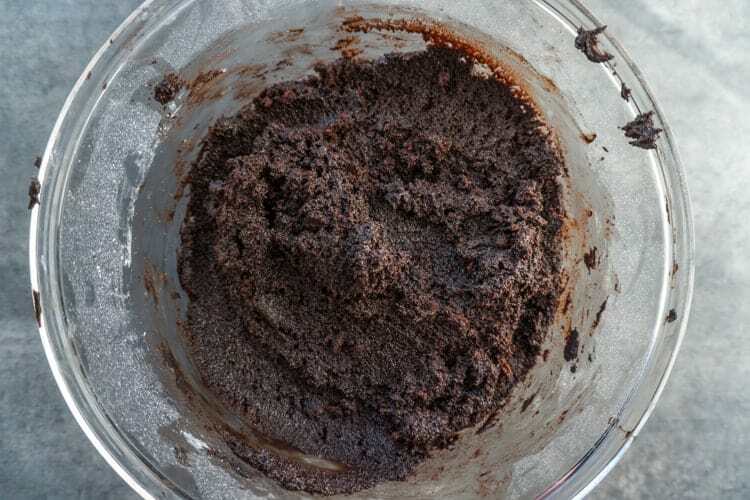 Combine melted butter and cocoa powder in a medium sized bowl. Alternate between adding in the powdered sugar and milk, stirring after each addition. Once cooled, using your hands, crumble the cake. Mix in the frosting so it is thoroughly combined. 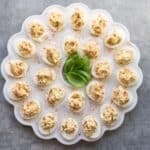 Form cake mixture into rounded balls and place on a parchment lined baking sheet. Melt ¼ cup chocolate chips in the microwave, stirring every 30 seconds until melted. 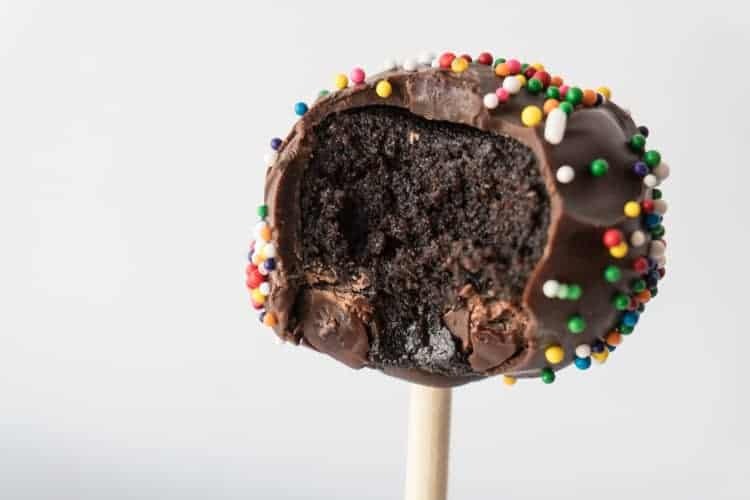 Dip one end of a cake pop stick into the melted chocolate and then insert it into the cake ball. Repeat with all the cake balls. Stick entire baking sheet into the freezer for at least 20 minutes. Melt the remaining chocolate (I usually only melt about 1 ½ cups at a time, use it up then melt more as needed). 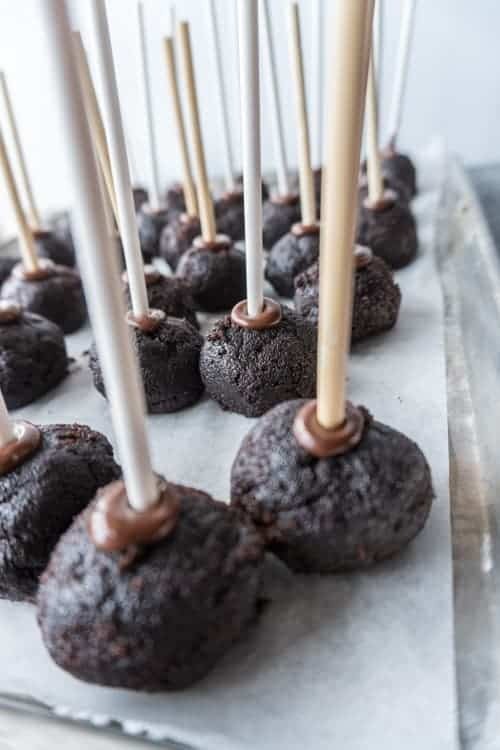 Dip your cake pops into the chocolate, spooning the chocolate up and over the sides to get a good coating. You can gently spin the cake pop to try to get the excess chocolate off. Decorate with sprinkles, stick into Styrofoam and let harden at room temperature. Once hardened you can eat right away or store in an air tight container in the refrigerator. *I used Devil’s Food Chocolate Cake Mix which requires 1 cup of water, 1/3 cup vegetable oil and 3 eggs. I also made adjustments for high altitude and swapped my cup of water for a cup of sprite, which in cakes gives it a light texture, but in cake pops it really doesn’t matter. 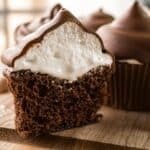 *The frosting is directly from the back of the can of Hershey’s Special Dark Cocoa powder and can be found here. 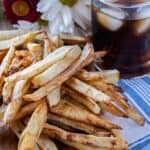 You can use regular cocoa powder if you don’t have the special dark. 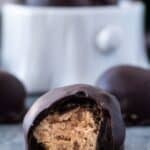 *I’ve since learned chocolate chips aren’t the best chocolates for this type of coating. It’s recommended to use candy melts, which will make a thinner coating than the chocolate chips. * You can use any Styrofoam as long as it’s thick enough to hold all the cake pops when you stick them in to allow them to harden. 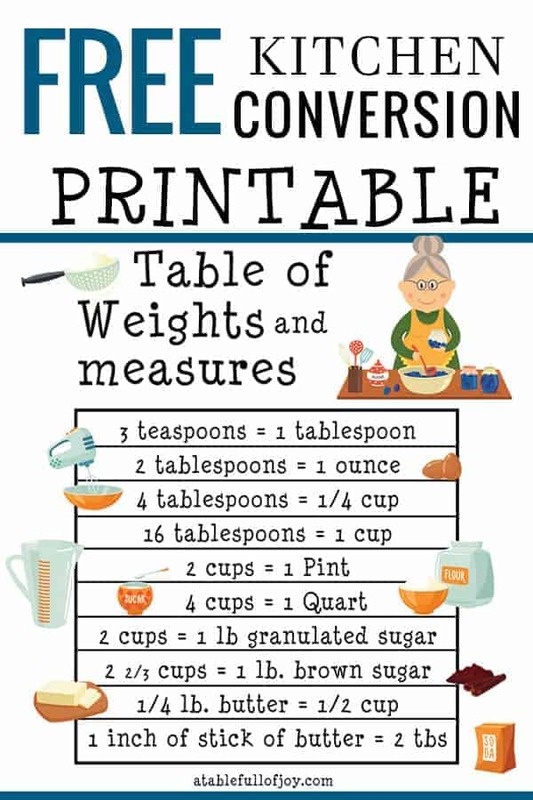 You can buy it from a craft store or Walmart, or use some from leftover packaging you have around the house (like me!). These are so fun! I love cake pops!! Beautiful with the sprinkles! 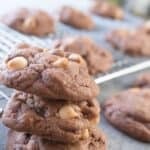 What a great way to turn a bit of a baking mess into something wonderful!! 😀 I love cake pops! Thank you! I hate when things go to waste so I was happy to turn a failure into a delicious treat nonetheless! Can’t wait to try this. I am planning to make this for our dessert tomorrow. My younger brother and sister will surely love this! 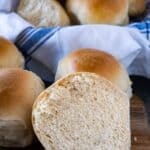 I’m super rubbish in the kitchen, but I’m trying to enjoy baking – this easy enough recipe will surely help! I hope you like it! 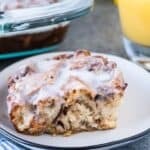 It did come about because of a failed cake recipe so regardless of how well we do in the kitchen we can always make something out of our struggles! I’m sure you will do great!